Learning to read begins long before school. “Children are made readers on the laps of their parents.” — Emilie Buchwald. It’s true – encourage your child to love books and you’ll have given them the best possible start to their reading journey. 1. Share stories everyday: share more if you can. Take books with you when you go out: books over technology any day! Go to the library; borrow books; go to a story class; swap books with friends and family; read books over and over again until your child begins to repeat the language used, and until you can no longer bear hearing “We’re going to catch a big one” again! There’s something magical about snuggling up with a book at bedtime and experts promote a story before bed as aiding sleep so it’s definitely worth a try! If you really are short of time, the CBeebies Bedtime Story is a good substitute every now and again, or a useful addition to your daily story! You will use hundreds of words a day but never as many as your child will pick up from a few extra books each week. Vocabulary development is crucial. 2. Sing songs and nursery rhymes. 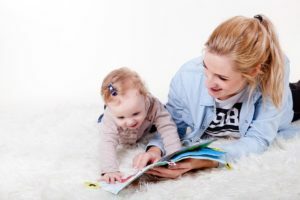 “Experts in literacy and child development have discovered that if children know eight nursery rhymes by heart by the time they’re four years old, they’re usually among the best readers by the time they’re eight.” Mem Fox. It’s true! Children often start school unable to identify rhyming words and this slows their progress in learning to read words. Make up strings of rhyming words (two, shoe, zoo, poo! Children love the word ‘poo’ sneaking into a rhyming string! ); make rhyming names (Sam Bam, Busy Lizzie); or make up rhymes for your daily routines or activities (Let’s go, heave, ho! In the car, we won’t go far). I thought ‘In the Night Garden’ was a load of rubbish until I had my own children and was a reception teacher at the same time! Even nonsense words count in learning to rhyme. 3. Listen to audio books in the car. Story CDs or Audible, whichever you prefer, there are some great story collections to enjoy over and over again (if you can stand them whilst driving) or just a few times each! Julia Donaldson stories have been firm favourites with the small passengers in my car, and they’re full of all the ingredients your child needs before phonics: rhyme; rhythm; alliteration (using the same sound to start words e.g. detective dog, big bad mouse, deep dark wood); repetition and fun with words, to name a few. In case getting the story stuck in your head all day isn’t enough, there are even songs to go with many of the stories! You too could find yourself singing about the Gruffalo at work! 4. Play with letters in the bath. A bag of foam letters (lower case) from Amazon or Wilkinsons has been one of the best resources for my youngest child. Without intending to, we began matching letters to family members, e.g. ‘d’ for Daddy, ‘g’ for Grannie and ‘h’ for Auntie Hannah, and then to other things such as ‘d’ for Daddy and dog and dinner. Before we knew it, each letter represented a sound in its own right and now we build words. You could do the same with magnetic letters on the fridge but stick to lower case first as these are taught before capital letter names at school. 5. Begin to point out sounds in words. Start with initial sounds: d-d-dog, ffffish. Look up how to say the sounds on the Oxford Owl website, as the purer you can make your pronunciation of them, the easier it will be for your child to begin blending them in to words. You may hear your child’s teacher talk about ‘oral blending’ which is when children can make a word from separate sounds. They need to do this before they can read them. Say ‘c-a-t’ and see if your child can blend and say ‘cat.’ You could call it ‘robot talk’ to encourage your child to try it, too. After a little time practising, your child will be ‘spelling’ words before reading. Once they meet the letters, and have mastered chopping words into syllables, reading will be easy! Reading will happen. Teachers will work their magic once your little learner starts school but with firm foundations, your child will jump into reading with positivity and confidence. It need not be a chore for you or for your children; starting reading habits now will make the school years run much more smoothly. At school, you’ll be asked to hear your child reading at least four times a week but don’t give up on the stories you read to them – reading comprehension has a high status in the National Curriculum and your child needs to have heard many, many stories to develop a deep understanding of texts. So, grab a book and snuggle up…read, read, read! Wanting a helping hand to get started?